The quality we are able to get with our professional telecines is quite good, but it heavily depends on the way your films were stored. 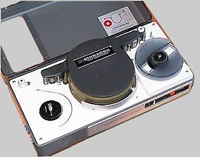 It is possible to copy up to 40 POLAVISION cassettes , or roughly 120 minutes, on a single DVD. For more than 10 POLAVISION cassettes, contact us. This price includes a thorough check and assembly of the POLAVISION cassettes, digitizing from your films to MPEG2 (DVD format) and DVD authoring and burning. You can get as many more copies as you want for an additional 6.00 € fee per DVD (excluding the blank disk cost). Please expect a delay of 10 to 25 workdays for the transfer.